Hear The Vanderbilt Melodores Tear-Inducing Cover Of YEBBA's "Evergreen"
The Vanderbilt Melodores are back with a new video for their "The Great Room Sessions" and it may just be their best one yet. 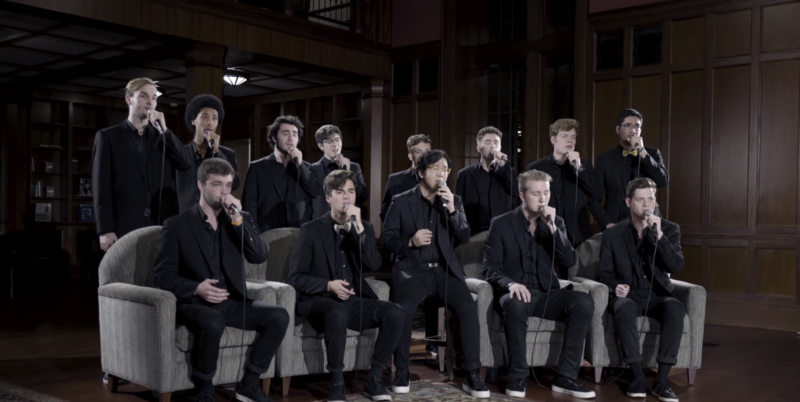 In a nod to one of their own, the all-male a cappella group from Vanderbilt University covers YEBBA's "Evergreen" and it's bound to make you emotional like only vocal music can. The song holds special significance as the Melodores use it as a metaphor for the group's "enduring brotherhood" which relates perfectly to lead soloist Phillip Kim. Kim recently returned from military service to a new incarnation of the Melodores. The group that he returned to was vastly different, both artistically and culturally, from the one he left. Still, the current members welcomed him back with open arms. And let us just say, his return can be felt immensely as he commands the solo in "Evergreen." Kim displays some of the most effortless singing you've ever heard throughout the video as he crosses between his gentle falsetto and smooth, yet powerful full voice. Kim displays a talent that is simply unlike anything we've ever heard in the vocal community, and we feel confident in saying that he's ready for the big leagues. But, it is not only Kim who shines in this cover video, the same can literally be said for the Melodores as a whole. The group beautifully portrays the grief, the comfort and the folk elements heard in YEBBA's original in magnificent fashion. Crystal clear vocals ring through with utter brilliance as each verse builds with emotion. This is truly a group who has mastered the art of acting as one instrument. This is one video that you MUST watch!